Golden Irony: If ‘Bamazon’ cast member Chantz Meadows had reminded producers that AU was also the periodic symbol for gold, maybe they would have let him wear this shirt on camera. 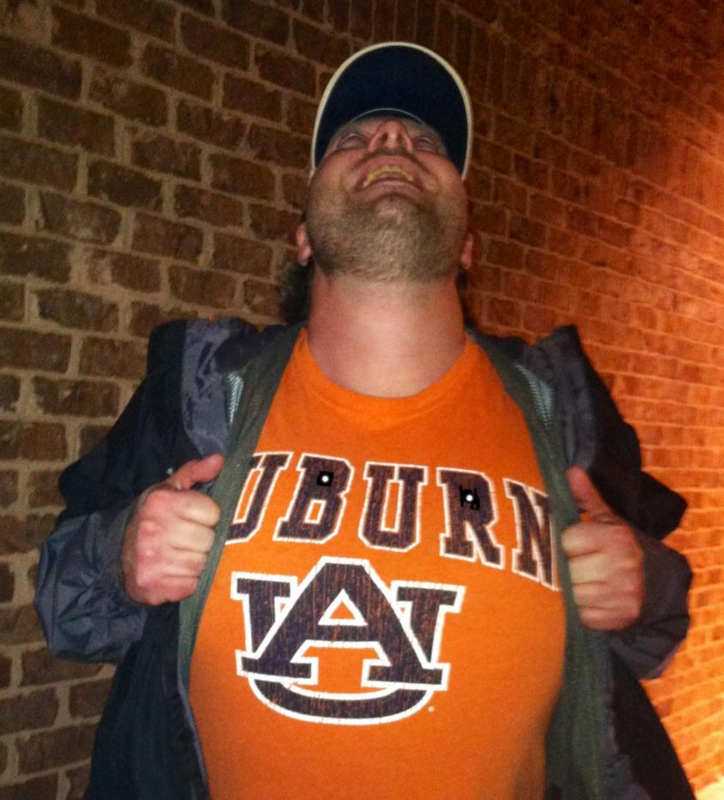 Chantz Meadows was in Auburn last night doing something he could never do in the Amazon jungle: wearing his Auburn shirt—or at least wearing it the right way. The now not-so-out-of-work construction workers were at Auburn’s Oyster Bar on Friday, drinking beers and signing autographs to promote the show’s season finale, which airs Sunday at 9 p.m. (CST). Meadows says he might not have had a problem with the policy had it been equally applied. Cast member John Wilson is frequently seen in a University of Alabama hat on the show; he’s even wearing it in his profile photo on the show’s website. “The UA was apparently OK to wear on screen but not the AU,” Meadows says. Meadows is a lifelong Auburn fan. His father graduated from Auburn in the 1970s. It did seem weird that there wasn’t a single AU fan on that show. I’m an Alabama fan, but I do agree that the rule should have been equally applied. Either Chantz should have been allowed to wear his shirt or hey should have found John a different hat to wear. I think the idea of the show was a bunch of hillbilly types in the jungle, and nothing conveys hillbilly like the Alabama “A: that they stole from the Atlanta Braves bout 10 years back. You start showing a bunch of guys with AU gear, and the viewers are more like, “so what, you sent a professional engineering crew from one of the nations best schools to the jungle. They got this. No reason for me to keep watching.” War Eagle anyway! Yeah, that was my first thought when I saw this picture of Chantz in his Auburn shirt: “Now there’s a professional engineer!” LOL! The truth is they’re all rednecks, not that there’s anything wrong with that. But the Auburn fans are too ignorant to realize that the ONLY difference between the guys who cheer for Alabama and the guys that cheer for Auburn is the color of their hat and their t-shirt. The only thing worse than being an ignorant redneck is being an ignorant redneck while thinking you are sophisticated. “Hello, my name is Jethro Bodine. I went to Auburn and I am smarture than Unkle Jed.” LOL! This is something that I just don’t understand. I noticed that cast member John Wilson got to wear his University of Alabama hat but, Meadows couldn’t wear the Auburn shirt. I’m a ‘Bama fan but, on this program I believe there should be an equal and diverse representation of what it means to be from the state of Alabama. I would think that most people from outside of the state and region know about the rivalry that exists between the two schools and just how important it is to Alabamians. Letting both cast members wear their apparel would definitely add to the show.